Inside, the musicians were warming up, and the acoustics were superb, thanks to high, solid wood ceilings, stone walls, and a full house of warm sound-soaking human bodies. I think that one of the most thrilling events in music is the moment when the concertmaster plays the tuning note for the orchestra, and they calibrate their sound to his. It feels as if the audience is also being tuned. The first half of the evening was the Scottish Symphony by Mendelssohn; the hardest name to spell in show business… it was an absolute delight. The National Academy Orchestra was glorious, individual parts sparkled through, and the big picture was always evident. As a reviewer, I felt required to concentrate plus be objective; but as a listener, I kept getting swept into the current- forced to surrender and feel the joy. Maestro Brott’s apprentice Brendan Hagan shared the conducting duties on this one, but the piece does not allow for a pause, so the hand-off of the baton took place on the fly, so to speak. It was quite charming to watch the seamless transition between conductors. At times it was evident that the orchestra was enjoying their part as much as I was mine, seeing the string section rocking from side to side, along with the music. If I were at home alone, I’d have done the same. It was great fun, and the quality of sound was lovely; rich, warm and clear. As the last notes resonated around the room, I looked around to see folks who were obviously as delighted as I was, mouthing the word “wow”. Walking into the lobby at intermission is another treat altogether at these shows. Denninger’s is a sponsor, and they make their presence known with heaping trays of delicious appetizers. I wasn’t there to eat, and so at first resisted, but eventually gave in, and was glad I did. I tasted a lovely smoked salmon on rye; and some brie with jam, and noticed several other very appealing items circulating. I had a glass of a very tasty craft beer, which cost about half of what I expected, and noticed that wines from Rockway Glen® were also available. The second half of the concert began with the Pan-American Overture, by Gary Kulesha. Hagan had another stint at the helm, and the orchestra responded beautifully to him. Coming between the two longer pieces, both by Mendelssohn, the overture had to fulfill the dual purpose of making its own statement while at the same time acting as a musical palate-cleanser. I thought it performed admirably at both those tasks and was a very smart bit of programming. I was very much looking forward to Martin Beaver’s performance. I was fortunate to see him perform as a child prodigy, and remembered him fondly. Who can resist the power, the passion and the swagger of a good violin concerto? He had me from the first notes, and didn’t let go until the end… this is a wonderful player. He has gorgeous tone, fiery technique, terrific taste; the whole package. The orchestra supported him beautifully as he soared through all the slashing and dashing violin tricks of the trade, confident and assured, always clear and precise and always dripping with gorgeous tone. His vibrato should come with a warning: -‘May burst heart’. The concerto’s maturity, elegance and passion belie the fact that its composer was a mere 13-year old. It’s lovely to listen to, and in the hands of a great player like Martin Beaver, it seems to be over in the blink of an eye. I wasn’t alone in that perception, clearly, as the audience would not let Mr. Beaver go even after all that he had given us in the concerto. He returned twice in response to standing ovations, to perform the last two movements of J.S. Bach’s Sonata No. 3 in C Major. The first encore was an achingly beautiful slower movement, emphasizing sweet tones and gorgeous melody, and then the evening’s finale; a show-stopping, jaw-dropping look-what-I-can-do that left me melted to my seat. After sitting in place for several minutes while I somewhat regained my connection with reality, we walked out the door of the church into one of the loveliest cool spring nights ever, and the glow of a spectacular full moon. Definitely “OMG”. 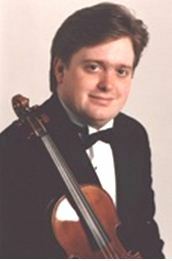 The next concert in the series, A Double of Brahms, is scheduled for Friday, June 8. For information on Brott Festival performances, click on its ad in the ARTS REVIEW.